Wheat is a key food staple that provides around 20 percent of the protein and calories consumed worldwide. 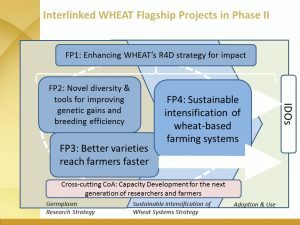 Demand for wheat will grow in coming decades to feed rising populations in the developing world, as economies grow, women and men seek employment in cities, and dietary habits change. Millions of smallholder farmers in wheat-producing countries will require support to raise crop productivity sustainably and to meet the demand of poor consumers. WHEAT offers productivity-enhancing options, helping smallholders to improve farming practices and make the best use of their land in ever more challenging conditions constrained by virulent diseases, less water, fewer agricultural inputs, rising temperatures and more erratic rainfall. intensification. Associated work takes place under theme areas known as Flagship Projects (FPs; see the table below) that tackle current and coming constraints to food security, improved farm livelihoods and sustainable development. The FPs reflect input from many knowledgeable and experienced partners. Wheat yields will be increasing by an average 1.5 percent each year. 30 million people (half of them women) will have been helped to escape poverty.